The Lord’s faithful servant Moses was not permitted to cross over with Israel to the Promised Land of Canaan. Deuteronomy 34 tells of the end of the Moses’ earthly life. He was permitted to ascend Mt. Nebo and view the land promised to the Patriarchs, and then he died. Then Moses went up from the plains of Moab to Mount Nebo, to the top of Pisgah, which is across from Jericho. And the LORD showed him all the land of Gilead as far as Dan, 2 all Naphtali and the land of Ephraim and Manasseh, all the land of Judah as far as the Western Sea, 3 the South, and the plain of the Valley of Jericho, the city of palm trees, as far as Zoar. 4 Then the LORD said to him, “This is the land of which I swore to give Abraham, Isaac, and Jacob, saying, ‘I will give it to your descendants.’ I have caused you to see it with your eyes, but you shall not cross over there.” 5 So Moses the servant of the LORD died there in the land of Moab, according to the word of the LORD. 6 And He buried him in a valley in the land of Moab, opposite Beth Peor; but no one knows his grave to this day. 7 Moses was one hundred and twenty years old when he died. His eyes were not dim nor his natural vigor diminished (Deut. 34:1-7). Mt. Nebo is situated in what was at that time the land of Moab. Our photo shows Mt. 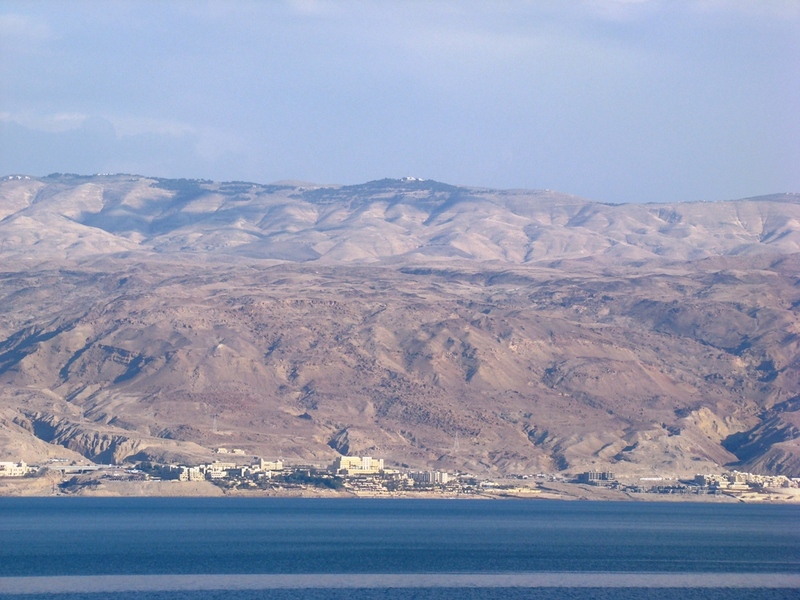 Nebo from the western side of the Dead Sea, looking east, i.e., the opposite of Moses’ view in our text. Mt. Nebo from west side of Dead Sea. Photo by Leon Mauldin, Sept. 2011. Top center of photo is Mt. Nebo, in the setting of the mountains of Moab. This entry was posted on Monday, November 28th, 2011 at 8:20 PM and is filed under Bible History and Geography, Bible Study, Old Testament, Travel. You can follow any responses to this entry through the RSS 2.0 feed. You can leave a response, or trackback from your own site. Unusually clear photo. Thanks for sharing.